From Super 7. 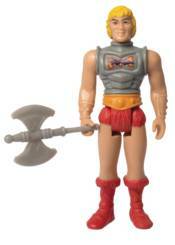 The iconic Masters of the Universe toys re-imagined as 3 3/4' action figures from the golden age! This Battle Armor He-Man and Battle Armor Skeletor figures feature these characters battle damaged after another battle! Blister card packaging.